At Mansouri Family Dental Care & Associates, we offer oral surgery procedures such as wisdom teeth removal. We do this to prevent serious oral health concerns in the future. It is a common procedure usually performed on teenagers. To read more information put out by the American Dental Association about why wisdom teeth need removed, you can find the information here. After your wisdom teeth are removed, it’s important to keep that area and the rest of your mouth clean to avoid infection and to prevent further dental issues related to plaque and tooth decay. Rinse with a prescribed rinse or with warm salt water 2 to 3 times per day for the next 5 days. Begin your normal tooth brushing routine the day after surgery. Be sure that you are avoiding the surgery location as best you can. If your mouth is sore or swelling it may prevent rigorous brushing of all areas, however make every effort to clean your teeth within your comfort level. Do not smoke for at least 72 hours after the procedure. Ensure that you are taking the entire antibiotic prescription as directed. If your doctor provides you with an irrigator or small plastic syringe to rinse your mouth, use it as your doctor advises to prevent food from getting stuck in the location where your wisdom teeth were removed. 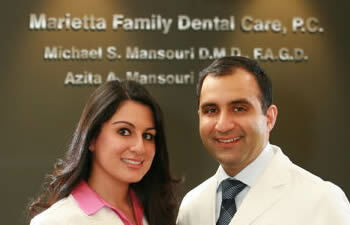 Call Mansouri Family Dental Care & Associates in Atlanta if you need expert wisdom teeth removal services.